When you choose a merchandising company, you are also choosing highly visible human representations of your brand. Making the right choice is critical. Our relentless spirit of excellence is evident in our four core values. Customer – To serve our customers, associates, suppliers, and the communities with excellence. Communication – To effectively share our culture with our associates, suppliers, and customers to increase sales and profits. Leadership – The ability to teach individuals and organizations to surpass themselves. Teamwork – A collaborative interaction to reach a common goal. 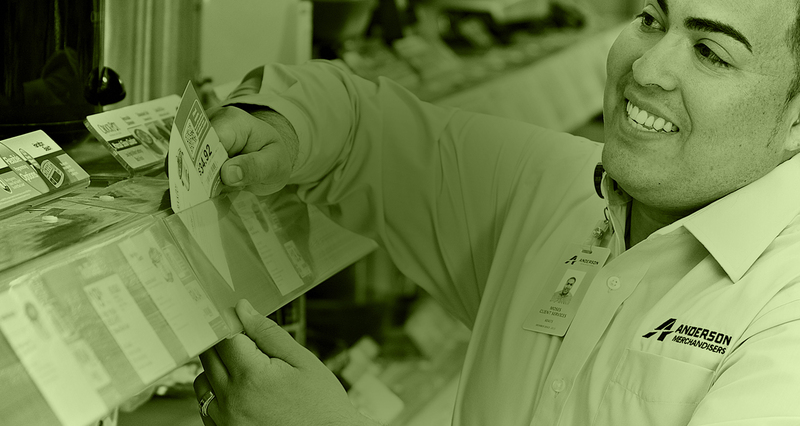 Our 10 Rules – Introduced 20 years ago by our executive leadership team, these rules have helped shape and position Anderson Merchandisers as a leading provider of in-store solutions. Every Anderson Merchandisers associate strives to incorporate the 10 rules into the day-to-day execution of our business. 1. Accept change by raising your expectations. 2. Perpetual acceleration through commitment. 3. Be knowledgeable of the unknown. 4. Consistently practice an entrepreneurial spirit. 6. Every day manage for results. 9. Always be responsible for your own morale. 10. Be a fixer, not a finger pointer.